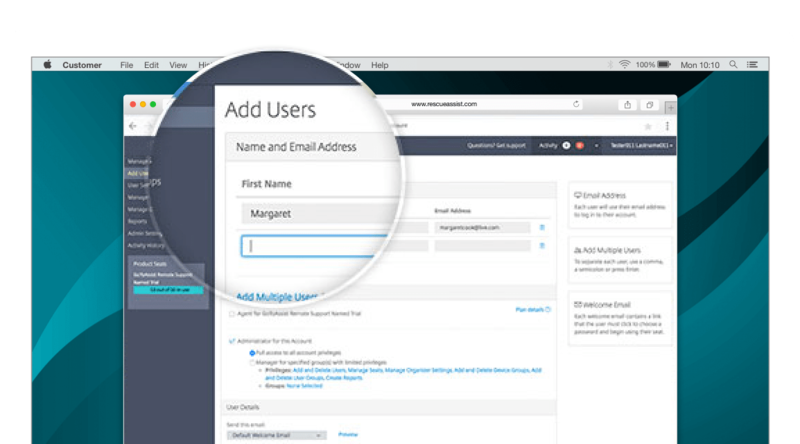 Set up multiple technicians and assign permissions in your online account. If you’ve got a large team of support technicians, you’ve already got a lot of work on your plate. The last thing you need is a complicated setup for remote management software. A cloud-based service, RescueAssist is easy to manage and even easier to use. You can get your entire team up and running in minutes through your online account portal. You can access your account settings from anywhere by logging into the RescueAssist website. Need to add users? No problem. Enter the technician’s information and assign their access level. They will then get an email to activate their account. 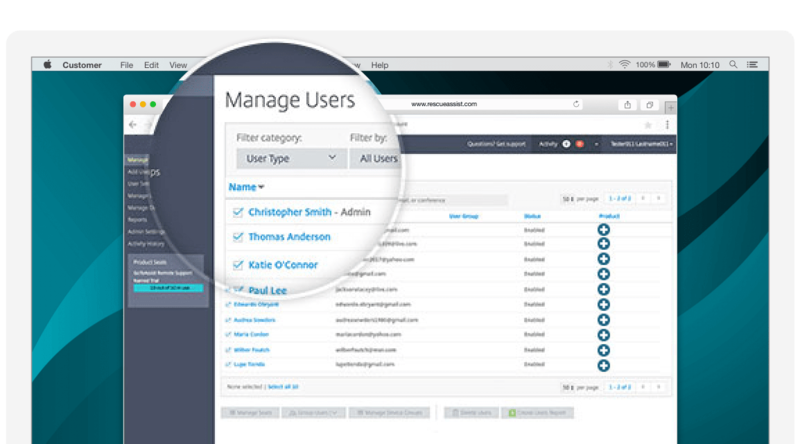 You can also manage your companies, contacts, customer portals and more in the same place. Your customers place a lot of trust in your team to access their computers and resolve their issues. By setting stricter technician permissions, you can ease their concerns and ensure a professional customer experience. RescueAssist lets you restrict unattended machine access, file transfer and remote control during a screen-sharing session. Add contact methods for your team. After you’ve set up users, you can choose how they’re notified of incoming chat requests. For example, you can add a mobile number for SMS-based texts. So when someone is out and about, they’ll get a notification right to their phone that a request has arrived. This way, your technicians don’t have to be tied down to their desk. Export reports and recorded sessions in multiple formats.